Unfortunately, spam slips onto just about every site on the Internet, and Android.SE is not an exception. This post is intended to provide a brief guide on dealing with obvious spam and advertising on the site. By flagging spam when you see it, the community can not only help moderators identify spam posts, but can also deal with the posts without any mod intervention. This means that the size of the community itself becomes a very effective tool in dealing with spammers. Don't worry about editing it. 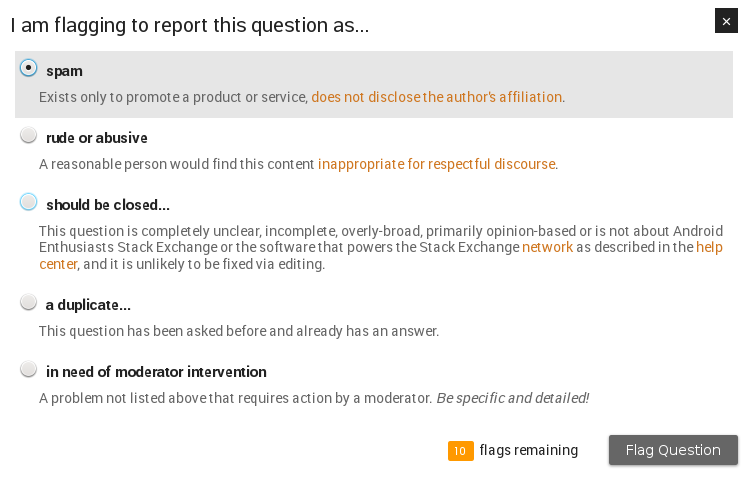 Spam posts will be deleted and locked anyway, and links on Stack Exchange sites use the rel=nofollow attribute, meaning that the links won't improve the site's search rating. Further, moderators and SE employees can search through deleted posts. If you leave the link in then it can be easier to determine how often something has been spammed on the site. If the post is a question, don't worry about voting to close. The spam flag will obliterate (delete + lock) the post anyway, so it won't matter if it was closed first. In general, don't worry about leaving a comment. Spammers know they're spamming, and they know that it's against the rules. They don't care, and leaving a comment is highly unlikely to have any meaningful effect (plus, odds are you'd just be talking to a robot). Don't worry about downvoting. You have a limited number of votes each day - use them on content that deserves those votes instead of on spam. As noted above, the flag will impose a -1 vote on the post anyway. Should we replace the content of spam posts so that they say they are spam?